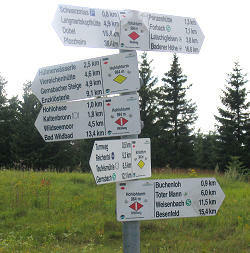 Hiking in the Black Forest has a long tradition. The Schwarzwaldverein, or Black Forest Association, has maintained a network of hiking trails for more than 140 years, in order to make the beauties of nature accessible to locals and tourists. And you don't have to start off with a complete long-distance hiking trail with a length of more than 200 km - there are countless local circular hiking trails with a great variety of lengths and levels of difficulty.